Summer is winding down, and it's easy to forget the importance of sun protection when we are not heading to the beach or at the pool every day. However, you have to remember to be diligent about protecting yourself and your family from the sun no matter what season it is, no matter what the weather is like. I am the first to admit that, like most of us, in my younger days, I was not very good about protecting my skin. I am a very pale gal, and a good 15 or 20 minutes in the sun without SPF, I burn like crazy. I have endured many sun burns, blisters, and even sun poisoning on a couple of occasions. Now that I am older, I realize how important it is to protect yourself from the sun, and I never let my boys or myself out of the house without sunscreen on! Coppertone Sport AccuSpray was developed to solve a common frustration – the cloud of spray people experience when using a spray sunscreen. The product has a new patented technology that creates a more targeted spray for less mess and waste. This one was a definite fave of my boys! I am super serious about sunscreen, but they hate wearing it. That is mostly because when I spray their old sunscreen, it goes everywhere! All over them, their face, their eyes, and the person standing behind them! This was a great improvement over sunscreens we have used in the past, and I really liked it! Coppertone ClearlySheer, which comes in two lines – Sunny Days and Beach & Pool – was created to provide women with a sunscreen that’s just for them. The brand new formulas are both incredibly lightweight and sheer so you’ll feel comfortable wearing them every day under your makeup or when you’re in the water. 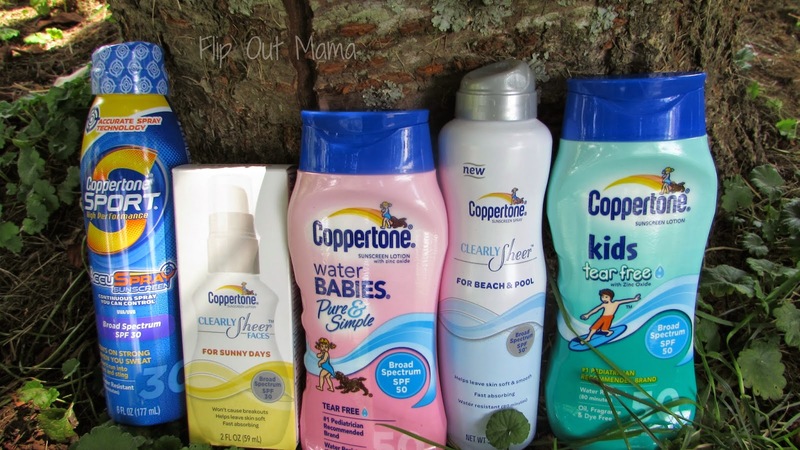 This is an amazing idea, and I am so glad that Coppertone came out with this line of products! I think that many women don't really think that they need an additional sunscreen beyond whatever is in their BB Cream or foundation. However, that is just not true! I love the Sunny Days line, I have been using it under my regular makeup every day, and there is no residue, no greasy build up! It's great! I really hope that this new line helps women to protect themselves from the sun every day, not just when they are on vacation! Coppertone WaterBABIES Pure &Simple Lotion: The #1 pediatrician-recommended product, specially formulated to provide broad spectrum protection for a baby’s delicate skin. The gentle, moisturizing formula is an essential for your water baby. Ahhh, WaterBABIES... It's been four long years since I needed a special baby sunscreen... Waaaaaaaah. My babies are all grown up now, but I still love this lotion. It smells like babies to me, haha! I'm passing this one down to my niece so she can protect her little Water Baby! 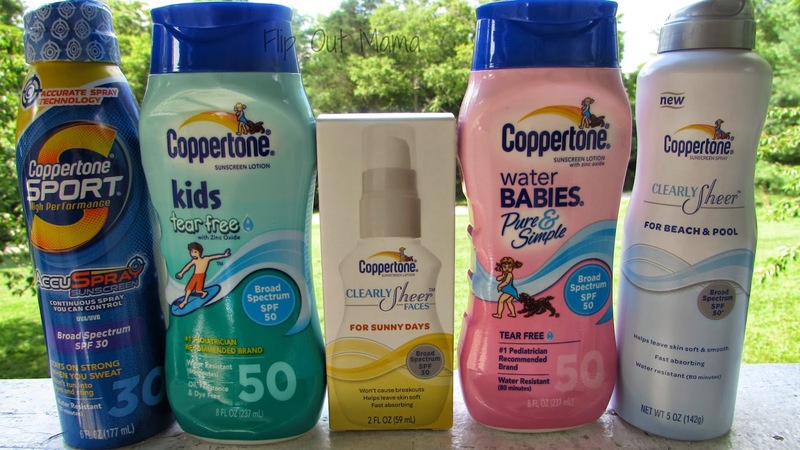 I really love Coppertone's products, and I am glad that my family is all set to continue to protect ourselves from the sun, even though now summer is winding down! It's just as important to use sun protection in the "off season" as well! The folks at Coppertone know this, and that is why they launched their 2nd year of their "Making The Sunscreen Grade" program. This is a fabulous program that educates parents, teachers, caregivers and camp counselors about sun protection so that they can set a good example for the kids in their care. This is a super program and I am really glad to see something like this being initiated by Coppertone. I think that if there had been a program like this around when I was in school, I might have paid more attention to sun protection, and saved my skin from a lot of burns! Definitely check out the details about this awesome program HERE! Oh, and don't forget to join Coppertone on Twitter and Facebook to stay up to date with all their latest products!